Houston synagogue flooded during Hurricane Harvey votes to demolish its damaged sanctuary. 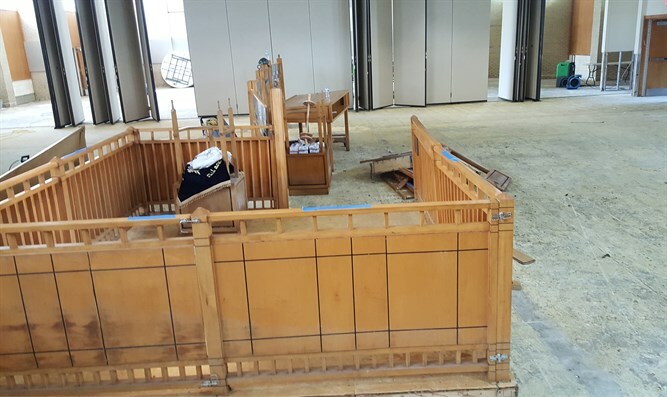 A room in United Orthodox Synagogues of Houston, stripped of its furniture and floors. United Orthodox Synagogues, a Modern Orthodox congregation in Houston that was inundated with seven feet of water during Hurricane Harvey, will demolish the sanctuary, offices and school wing of its building. The congregation’s elevated reception hall will be used as a temporary sanctuary space for the immediate future, the Houston Chronicle reported Tuesday. Synagogue members voted to make the move in December after Harvey’s devastation at the end of the summer. But it was also the third year in a row that the synagogue, located in the flood-prone Meyerland neighborhood, had been hit with water damage.